Obituary – Harbaugh, Russell Henry « Perry High School Alumni Association, Inc.
Hi-Y; Blue Curtain Dramatic Club; Glee Club. ﻿Russell H. Harbaugh, 70, Enid, formerly of Perry, died Friday at an Enid hospital. Funeral will be at 2 p.m. Sunday at the First Presbyterian church at Enid with Dr. Leslie G. Everitt officiating. Burial will be at Memorial Park cemetery, Enid, under direction. of Henninger-Allen Funeral home. Harbaugh was a cousin of R. C. “Bus” Dotts and Mrs. Bessie Beasley, both of Perry. He was a graduate of Perry high school and attended the University of Oklahoma. He was a captain in the United States Air Force during World War II in the Pacific Theater. He was owner of the Western Bridge and Supply Co. of Enid. He was an elder of the First Presbyterian church, a 32nd degree Mason, member of the Enid Masonic lodge and a Shriner of the Akdar Temple of Tulsa. 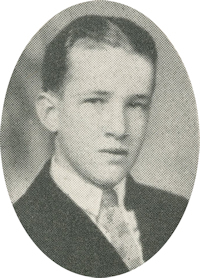 He is survived by his wife, Dorothy, of the home; a son, Russell H. Harbaugh Jr., Tulsa; a daughter, Ann Moore Harbaugh, Colorado Springs, Colo.; two sisters, Mrs. W. M. (Beryl) Schump, Herrington, Kan.; and Mrs. L. D. (Alpha) Wright, Oklahoma City; a brother, Charles Robert Harbaugh, Galveston, Texas; and two grandchildren.